The School of Law's advocacy program dates back as early as the 1930s. During this period, mainly internal law school moot court competitions were held. The idea of intercollegiate competitions took hold in the 1950s and the School of Law fielded teams from time to time. In 1979, UGA began competing in mock trial tournaments. In its inaugural competition, the Intrastate Mock Trial Tournament, the School of Law teams placed first and second overcoming teams from Mercer and Emory universities. 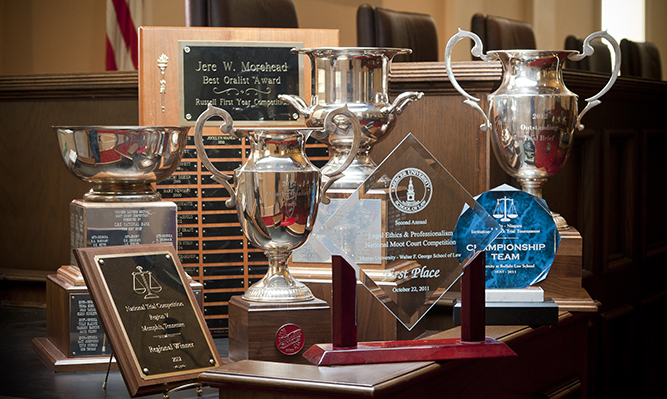 Over the years, the School of Law has compiled a rich tradition of winning. Here is an overview of the institution's impressive winning record dating back to the 1960s.